Happy New Years Eve friends! The holidays are OVER. Well, for now. On New Years Eve I hosted a little party for 3 friends. Yup, there were 5 of us total. Was a real rager. My husband had the amazing idea of getting a little tin of caviar. Caviar has got to be one of my favorite "treats" and so I suggested we get 2 of them. Obviously caviar is a luxury that we don't often indulge in and I was craving this "treat" over the weekend. As a pretty awesome alternative I picked up some Nova smoked salmon. 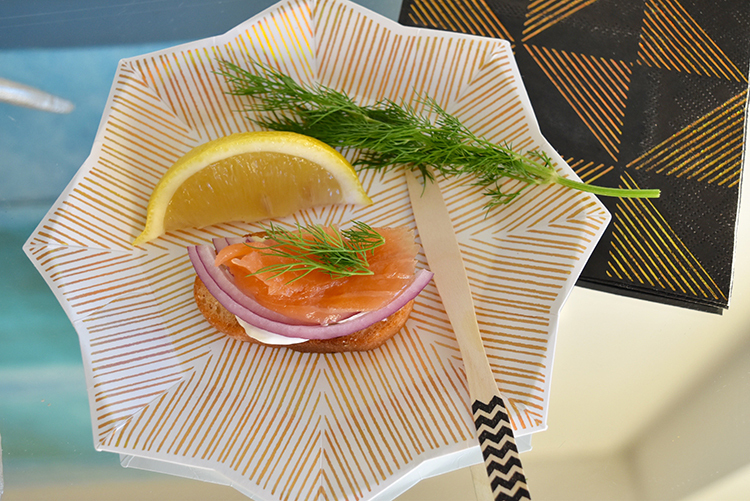 I am a tad obsessed with this bright DIY platter including cold creme fraiche (or sour cream if you have on hand), fresh dill, crostini (I found pre-sliced + toasted at Whole Foods), thinly sliced red onions and wedges of lemons. I put the sour cream in a small espresso mug. 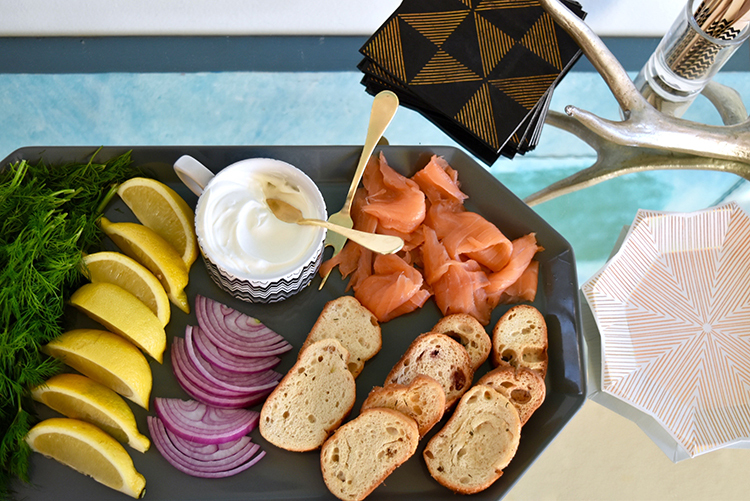 And then of course added a gold serving knife so we could spread onto crostini as we please. Not sure I can explain to you how gorgeous and delicious this little bite of food is. Top it with a small sprig of dill and you've got total perfection. Does party food get prettier or more fun then this? Last but not least, use your leftover new years supplies! Over the next few weekends, football Sundays, cocktail hour and girls night out you can throw this together and use up your leftover napkins, plates and forks. Let's eat a lot of good food this year. How does that sound?